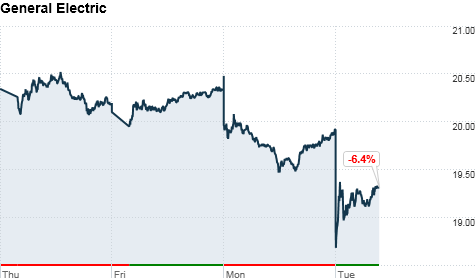 NEW YORK (CNNMoney) -- Shares of General Electric dropped 2% Tuesday as investors questioned the future earnings potential of the industrial conglomerate's energy business in a post-Japanese earthquake environment. 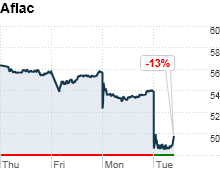 The decline follows a 3.5% drop in GE (GE, Fortune 500) shares the day before. GE has become the U.S. company most tied to the Japanese crisis because it designed the six nuclear reactors at Japan's Fukushima Daiichi nuclear power plant. Current reports say Tokyo Electric Power Co. employees have been ordered to evacuate, and it appears a meltdown is highly possible at at least one of the reactors. Analysts believe the selloff in GE shares is overblown. While GE's nuclear business may see an earnings drop, they say the rest of the company remains well-diversified. Nuclear energy remains a small part of GE's overall business. The division had about $1 billion in revenue in 2010, compared with the $40 billion GE took in at its entire GE Energy business, according to a GE spokeswoman. GE had about $152 billion in overall sales in 2010, making its nuclear division contribute less than 1% of total revenue. Despite nuclear energy being a small part of its business, GE has been pushing to grow the company's nuclear energy division, especially as global energy conversation focuses around low-carbon forms of energy production. "While nuclear energy has never been a big chunk of what GE does, it was always highlighted as a growth part of GE's business, particularly as nuclear energy was gaining more momentum," said Morningstar analyst Daniel Holland. Last year the company added five new sales offices in Asia, and last week it announced it would begin selling its latest generation nuclear reactor model. A meltdown at the old GE-branded nuclear reactors in Japan, combined with a chilly political climate for nuclear energy, could create more difficult headwinds for GE to grow that business, analysts said. There is also the potential for legal liability related to the Japanese nuclear reactors, but analysts do not think that will eventually be the case. While the reactors were GE-designed, they were run and managed by the Tokyo Electric Power Co.
Deane Dray, an analyst with Citigroup, said GE is expected to remain financially insulated from any liability related to a possible nuclear meltdown due to a Japanese law that places the responsibility for nuclear accidents on the shoulders of the plant operator, not designer. Shares of Prudential (PRU, Fortune 500), Hartford Financial (HIG, Fortune 500) and Aflac (AFL, Fortune 500) also dropped sharply Tuesday as investors worried about how much exposure insurers have following Friday's earthquake and the potential of a nuclear meltdown. Aflac, which does 75% of its business in Japan, saw its shares fall 6% in midday trading. The drop comes despite the company saying that only 5% of its in-force policies were from areas affected by the earthquake. Aflac reaffirmed its 2011 full-year guidance. 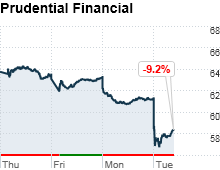 Prudential shares were down 2%. The New Jersey-based company recently increased its business in Japan, buying parts of AIG's non-life insurance business in Asia for $5 billion back in September. Risk management firm AIR Worldwide gave an early estimate Sunday that the total amount of quake-related claims would be between $15.5 billion and $35.5 billion. The estimate is only for earthquake-related damages and does not take into full account the damages from the tsunami and the possibility of a meltdown at the Fukushima nuclear power plant. With that in account, AIR expects this earthquake to cost more than Hurricane Katrina. The panic has begun. What now?